| We Have the Answers to Your Questions | How Will Your Credit History Affect Your Borrowing? How Will Your Credit History Affect Your Borrowing? When it comes to borrowing, what role does your credit history play? This depends on what type of loan you are interested. The great thing about unsecured borrowing is that lenders aren't overly concerned with your financial past. 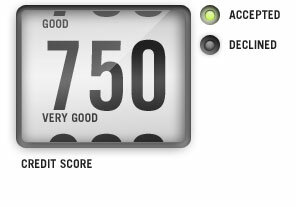 Your paycheck or valid source of income acts as collateral when you are applying, so why would your credit score matter to a provider? When you opt for a secured lending product with a significantly higher balance requested the requirements become more stringent. We will explain the options available to those who are currently dealing with financial blemishes. The score you are assigned basically shows how reliable you have been when it comes to paying off debts that you have incurred over the years. There are three prominent bureaus in the United States (Equifax, Experian and TransUnion) that put together complex algorithms that measure outstanding debts, timeliness in repayment, amount of credit available and more. These companies then assign a score that ranges from 300-900 to represent the creditworthiness of a consumer. Since each company has established a unique scoring method, your figure may vary among them. It is important to regularly review your report to ensure accuracy. There are online resources available that allow you to review your report for free and you are entitled to request a free report from each bureau annually. If you want to review your score, sometimes you may be subject to a nominal fee. Thankfully, most short-term lenders are not concerned with this information which makes it easier for those with previous blemishes to get the money they need before their next paycheck. If you are not satisfied with your current standing after reviewing your report, there are steps you can take to improve your situation and boost your creditworthiness. The first and foremost thing you need to do is pay your bills on time. This may seem obvious, but it is the single most important aspect the bureaus use to assign your rating. It doesn't matter so much that you pay off your card balances in full each month, but it is crucial to meet the minimum payment every single time. Next, carrying diverse types of loan balances can enhance your standing. For example, having a mortgage and a car payment with a credit card might suggest you are a well-rounded consumer if you are paying bills on time. As we explained earlier, unsecured borrowing options are perhaps the most convenient ones for those who need money quickly but don't have an established track record to rely on. If you regularly receive a paycheck of at least $1000 or receive some other source of valid income such as Social Security or disability benefits, that is usually all you need in order to qualify. Review the diagram above to see what type of option will suit you best. As you can see, there are options for consumers on all ends of the spectrum so you can enjoy peace of mind when it comes to applying. We are confident there is an option that will work for you if you take a minute to submit our no-obligation application form. You can see how much you are pre-qualified for and be paired with a lender that can help you take control of your monetary situation with ease. You won't have to stand in line or fax documents in order the get the money you need delivered quickly. This is our commitment to you as a trusted short-term borrowing resource you can rely on.